This was a 60km training walk on Sunday May 19, 2013. 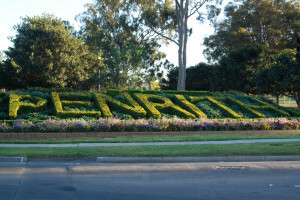 I took a train to Penrith, a major suburb on the far western outskirts of Sydney. I then walked back to Epping station 60km away. The walk took me down Castlereagh Rd, Andrews Rd and then The Northern Rd to the village of Windsor. From there I followed the cycle path along Windsor Rd as far as Showground Rd, just after the Castle Hill golf course. It is mostly flat west of there, although Rouse Hill is definitely on a hill not that you notice it when driving. After 40km of walking, I certainly felt it enough. Showground Rd took me up to Castle Hill, through the town centre, Old Northern Rd then Castle Hill Rd to Pennant Hills Rd. The last stretch was along Beecroft Rd as far as Epping Station where I caught a late train home. The last train to Chatswood had gone, it being close to midnight now, so I had to get a late express into Central and then home from there. Not a bad walk for training, though I slowed more than I would have liked once I hit the hilly areas. Between Penrith and Windsor there is basically no footpath, so walking is along the shoulder of the road. My right foot started to get quite sore from the camber at the edge of the road. The biggest danger is moronic, aggressive drivers of which Australia has many. I’ve noticed on other walks that some will deliberately swerve towards me. Many give a blast on their horn – not to warn me, just as either a joke or to intimidate. Truck drivers do it too. I’m sometimes reminded of the case of poor cyclist Dominic Mason who was killed when a truck driver thought it would be either funny or terribly masculine to give him a bit of a scare by swerving towards him. That driver didn’t just scare him, but squashed him. Luckily we walkers/runners don’t have to actually stay right on the road and so hopefully have a better chance of escaping these neanderthals who infest our roads.